This is considered as one of the most auspicious yoga of Astrology, but again lots of conditions to fulfil before this yoga can give 100% results. First, lets see what is Budh-Aditya Yoga? Budh means Mercury and Aditya means Sun. 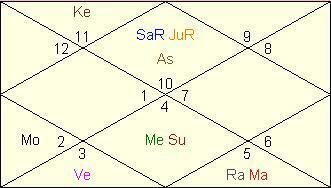 So, whenever Sun and Mercury are placed in 1 house in any horoscope, it is said to make Budh-Aditya Yoga. But then Sun and Mercury are always within 27 degrees from each other, as Mercury is the closest planet to Sun, so 90% of population have this yoga. What makes it really fruitful is the house and sign placement. Impact - Normally, Sun burns the qualities of planets which comes near, but Mercury is always the nearest to Sun, so Mercury is used to heat and fire of Sun. In this case, Sun now brightens the qualities of Mercury. As Mercury represents communication skills, logical thinking, intellect etc, Sun brightens all these qualities and helps the Mercury in every possible way. 1. Sun and Mercury should be closer to each other, degree wise. It should not be that Sun is at 2 degrees and Mercury is at 25 degrees in the same house. In this case, there is no conjunction actually, as both planets are too far from each other to effect each other's energy. For making any good conjunction, planets should be within 10 degrees of each other. 2. Planets should not be debilitated, means this conjunction should not happen in Libra (where Sun is debilitated) or Pisces (where Mercury is Debilitated). 3. Housewise, it should be in Kendra (Houses # 1, 4, 7 & 10) or Trikona Houses (Houses # 1, 5 & 9), like in the picture given, Sun and Mercury are in 7th house. In Kendra or Trikona houses, this yoga gets its real strength. 4. Person should go through Sun or Mercury Mahadasha/Antardasha. @ Mamta - every chart has many rajyogas. She has couple aparently. My daughter dob 06/02/2017. Time 16:23. Place delhi (india). Have budh aditya yog, or any rajyog????? But if Mercury is conjunct within 10 degress it will be combust so with combustion also these yoga works?